Blackmore Wagyu is an award winning and internationally recognised producer of 100% Fullblood Wagyu beef, cattle that are not diluted with any other breed. Founder, David Blackmore pioneered the production of 100% Fullblood Wagyu beef in Australia, having imported more than 80% of the Wagyu genetics into Australia between 1992 and 2004. Blackmore Wagyu is a family owned and run business having been in operation for over 30 years. Our premium Wagyu product is marketed to gourmet butchers and high end restaurants domestically and exported to 14 countries. David Blackmore monitors every stage of the animals life, from conception to plate, with care and accuracy to ensure a consistent and quality product. Our supply chain, which takes four years to complete, provides greater control over all stages of the production life-cycle. This sets us apart from most other Wagyu brands, as we breed, feed and market all of our own animals. The Blackmore Wagyu breeding program selects the best genetics to suit Australian conditions and ensures that every Wagyu animals’ breeding partner is individually matched using accurate performance data. Our careful breeding program combines Japan’s three most famous Wagyu bloodlines; Itozakura and Kikumidoi to increase size, fertility and robustness. We use Japan’s most famous Wagyu cow, Kikutsuru, and her equally famous Wagyu sons, Tanifukudoi and Dai 2 Yasutanidoi to increase carcass quality, which covers all quality traits and not restricted to marbling alone. The third bloodline is our exclusive Okudoi 100% Tajima cow family. This family is a descendant from the only 100% Tajima cow ever to be exported from Japan, Kinu 1. These bloodlines allows us to produce Wagyu that can be farmed and raised to their genetic ability. The genetics of the Blackmore Wagyu herd can be traced through parent verification using the latest DNA SNP technology, while the registered Japanese ancestry can be traced through nose prints collected by Japanese breeders, a similar concept to that of a fingerprint. Our genetic information plays a vital role in delivering a high quality product and is therefore protected information. If you would like access to this information please contact us. Blackmore Wagyu uses unique farming methods; combining old world Japanese farming, with new, technically sound scientific methodologies. This combination contributes to the improvement in both the meat and the quality of the animals’ lives. David Blackmore’s innovative approach to Wagyu farming, expanding 30 years, has led to the introduction of best practices and quality assurance schemes outside those recommended by Australian regulatory bodies. These practices and schemes involve areas of, but not limited to, animal welfare, land quality, water efficiency, and climate variability. 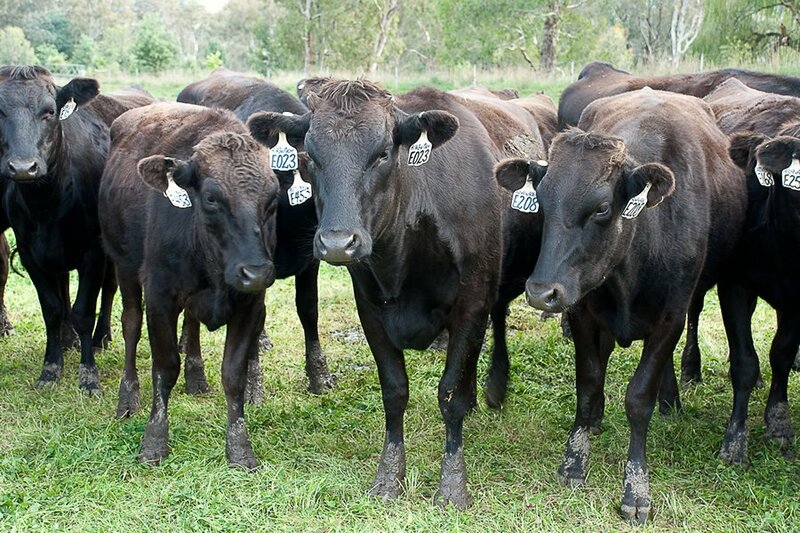 The Blackmore Wagyu farm is situated in the Victorian high country, at Alexandra. The location was specifically selected for its natural lagoons and old river red gums allowing the cattle to be bred in a natural, clean and sustainable environment. Our Wagyu calves are raised naturally on their mother’s milk and pasture for the first 6 months, which is both natural and healthy. At 6 to 10 months of age animals are fed on an irrigation pasture and introduced to a non-grain ration. They are either selected for our breeding program or enter our eco-feeding® process. Every Blackmore Wagyu animal is recorded in our custom built database. Blackmore Wagyu Beef has the goal to change the way we produce our Wagyu to set a new benchmark in animal welfare and sustainability. We have established a new standard, called eco-feeding® which will deliver a new benchmark for animal production. Eco-feeding® is a multi-faceted standard that includes animal welfare and husbandry, environmental management, nutrition, food safety and product integrity. Our cattle are raised on their mothers until they are weaned. After weaning our animals have access to pasture and fed our supplementary ration for 100+ days. Our animals are then finished for 600+ days on our secret feed ration in a low density lot feeding system. Our secret feed ration is fully sustainable with natural feed commodities that are not usable for human consumption. Our objective is to feed our Wagyu animals natural commodities that are by-products of human food production. Our eco-feeding® standard ensures we have full control over the animals humane management and welfare. The eco-feeding® standard implements the maximum standards for animal production, far exceeding industry requirements. Blackmore Wagyu uses the AUS-MEAT grading system for all carcasses with independent AUS-MEAT graders assessing every carcass to ensure the quality and consistency of the Blackmore Wagyu brand. All grading is conducted at the AUS-MEAT recommended site of the 10/11th rib between the Cube Roll and Striploin. After two decades of investment in high-value, Japanese Wagyu cattle, Australian producers are starting to reap the rewards. One of the worlds most exclusive product produced by Australian Wagyu breeders is sought after by top chefs the world over.